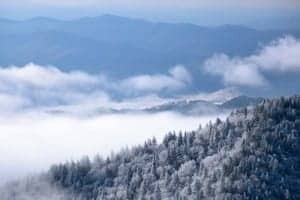 The winter weather has officially made its way to the Great Smoky Mountains. The treetops are covered with sparkling white snow, and many visitors have been overjoyed to be ‘snowed in’ in their cabins. When you’re enjoying the Smokies this winter, what better way than to celebrate with a winter-themed event in the most visited national park in the U.S.? Taking place on February 22, 2014, Kris Light will present “Jewels from the Sky” at the Sugarlands Visitor Center Training Room. This program is limited to the first 50 people who register by February 20, so you don’t want to waste any time! The cost to attend the event in Gatlinburg is $10 for members of the Great Smoky Mountains Association (the national park’s oldest non-profit funding partner), and $35 for non-members. The $35 cost includes a gift or personal membership opportunity as well. Sugarlands Visitor Center is located inside the national park at: 1420 Old State Highway 73 Scenic. Visitors heading to Sugarlands Visitor Center, from Pigeon Forge, should take the Gatlinburg Bypass and follow the signs. When you’re making plans to take part in the event in Gatlinburg, take a look at Aunt Bug’s Cabin Rentals’ one-bedroom and two-bedroom cabins. With cabins in Gatlinburg and Pigeon Forge, you’re sure to find one that’s perfect for your trip. For more information about the Great Smoky Mountains National Park and surrounding cities, take a look at our ‘About the Area’ page on our website.